Dogs who are understimulated mentally and physically can engage in repetitive barking to alleviate their boredom. Providing your dog with things to do during the day, as well of plenty of exercise, can go a long way toward decreasing this type of barking. Take your dog for long walks (or longer ones if you already walk your dog) and give the dog time during walks to sniff and engage in the environment so that he gets physical AND mental enrichment. When you can’t be with your dog, give him a food-stuffed or puzzle-type toy to work on so that he has a more positive activity to engage in than barking. Dogs that are fearful, anxious or stressed can use barking as a way to express their need for the “scary” or stressful thing or situation to go away. Helping the dog learn that whatever he is afraid of is not a threat is the key to solving this type of problem. Some dogs, particularly dogs of guarding-type breeds or mixes, will bark to “alert” you of the presence of something new in the environment. In this situation, you want to provide the dog with an alternate behavior. For example, if your dog barks feverishly when the delivery man comes to the door, teach your dog a really strong recall (come) cue and use that to interrupt the barking. Reward the dog for ceasing to bark and coming to you, and gradually you can extend this to a “come and lie down and stay” behavior. Many dogs who become overly excited and who lack impulse control can bark to express their “enthusiasm.” My dog Odie is a puppy who came from a deprived background during his critical development period and lacks a lot of impulse control. With these types of dogs, you can work on training some “self control” behaviors, such as a sit or down stay, or even any type of alternate behaviors, such as a trick. The key is that the dog is doing something else that isn’t barking. So in Odie’s case, I taught him to target my hand with his nose, shake, high five, bow and a variety of other tricks, I also taught “traditional” cues such as sit and down, and when he begins to bark excitedly at home or in a class, I immediately ask him to do one of the behaviors and reward him for it. Training impulse control behaviors such as stays and settle can also be very helpful with these types of dogs. Another important thing to remember with dogs that bark is the influence of breed. 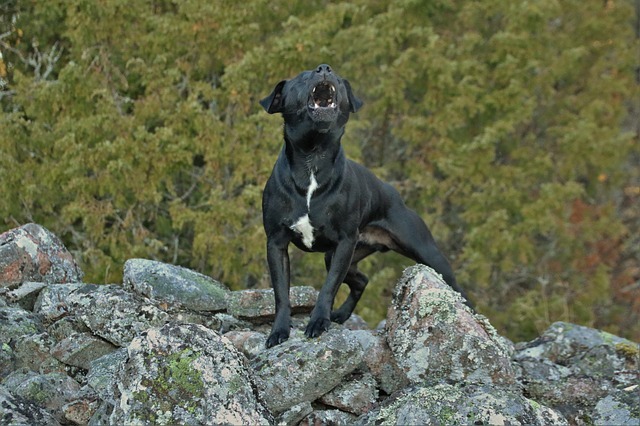 Some breeds have a tendency to bark more than others, such as terriers, shepherds and hounds. Take some time to research your specific breed, or breed mix to see what the breed(s) was originally bred for and what behavioral tendencies are common to help you understand the basis for barking behavior. Always avoid punishing your dog for this behavior – most dogs bark due to an underlying emotional issue and punishment can either increase the barking or lead the dog to expressing their needs with an equally undesirable behavior. If you find you need assistance, particularly if the dog is barking due to a serious behavior concern, contact a professional to guide you. Visit the American College of Veterinary Behaviorists, the Animal Behavior Society, and the IAABC to find a professional near you.